Katy Fitzpatrick has worked for ten years in the field of arts education, working primarily within the visual arts. Her main areas of interest are interdisciplinary, collaborative and participatory art practices, with a breadth of experience in gallery outreach and community-based programming. She has curated multiple programmes, events and exhibitions with a focus in the past three years on family and children’s engagement with contemporary art. These include the large-scale project BP Saturdays at Tate Britain and Light Rhythms, a family exhibition responding to Patrick Scott’s work, at IMMA. 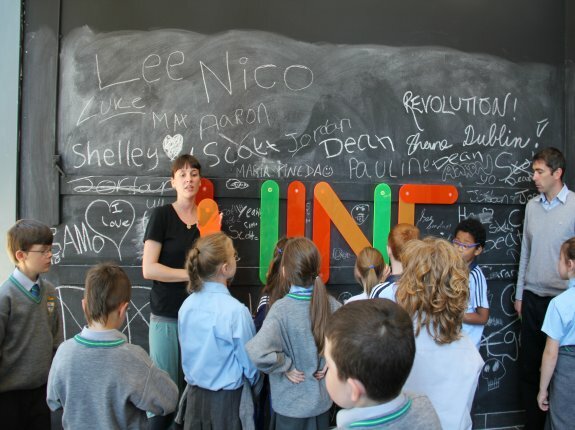 As a freelance curator she has facilitated (along with philosopher Dr Aislinn O’Donnell) three projects in primary schools which are based on philosophical discussions about contemporary art practice (including for the LAB, Dublin City Council, EVA International, Limerick and the Mobile Art School); worked as Acting Artistic Director (current) for Helium Arts; worked as project manager, curator and mentor on an arts and health project with teens for Helium Arts; delivered lectures in the fields of art history and arts and education including currently for Marino Institute of Education; sat on a number of selection panels (including for Dun Laoghaire Rathdown County Council’s Arts Office, the Performance Corporation and Studio 468); devised and written content for the Irish Times, Art in the Classroom supplements; and currently she sits on the Studio Management Team for Studio 468, a community-based artist studio in Rialto, Dublin 8. Previous full time roles include Children’s Programme Coordinator, Irish Museum of Modern Art (2013 – 2014); Curator, Early Years and Families, Tate London (2012 – 2013); Education Curator, Dublin City Gallery The Hugh Lane (2007 – 2011) and Outreach and Centre Manager, Dance Theatre of Ireland (2005 – 2007). Katy has an MA in Visual Arts Education from the National College of Art and Design, Dublin and a BA in Art History and Italian from University College Dublin. Her MA thesis, titled The Drama of Art, an Interdisciplinary Approach to Gallery Education, examined an interdisciplinary project for secondary school students at The Hugh Lane.